There are a number of entities exploring fixes for Ontario's dysfunctional electricity market - few of which can admit it is dysfunctional. Yesterday the Hamilton Spectator had an article on the topic, based on the "Putting the Pieces Back Together: "True Pricing" for Ontario Electricity" paper I noted in an earlier post. Ontario's electric system operator (IESO) has multiple "stakeholder Engagement" groups working towards alleviating, or expanding, problems with coordinating supply and demand - depending on the stakeholder. Last summer the regulator (Ontario Energy Board - OEB) tepidly explored alternative schemes for setting time-of-use rates. Discussions are dominated by the few entities, or stakeholders, benefiting from lucrative private contracts financed through higher consumer rates and lower payments for public companies. The discussions are not only be burdened by the lobbying of the participants on the stakeholder side; public employees are burdened by an inability to note the faults in the government's directions. The stakeholder sessions seem interested in where we are, but in not being able to honestly address how we got here seem oblivious to the direction we are moving in lest we break the inertia of the current, poorly labeled, stakeholders. This post will add to a number of previous posts is assessing Ontario's current situation, particularly my most recent writings on the global adjustment mechanism, capacity payments through the net revenue requirement mechanism, and the transfer of value from public assets to private ones. - Fall on Me, R.E.M. In 2000, Ontario's PC Harris government was moving towards privatizing the electricity system in Ontario concurrent to the Alberta's PC government working towards the same goal. In Ontario, price spikes and tight supply conditions led Harris' successor, Ernie Eves, to freeze pricing shortly after the market opened in 2002, which essentially abandoned the movement towards a functional Ontario market. Using AB definition of On-Peak: "hour ending 08:00 through to hour ending 23:00"
Reviewing the years since 2002 in the two provinces is useful. 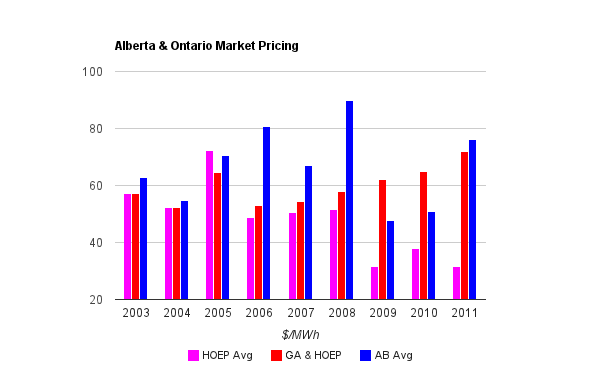 The AESO 2011Annual Market Statistics provides figures for Alberta, with Ontario Data from the IESO's Hourly Ontario Energy Price (HOEP). In 2003 the prices were similar. 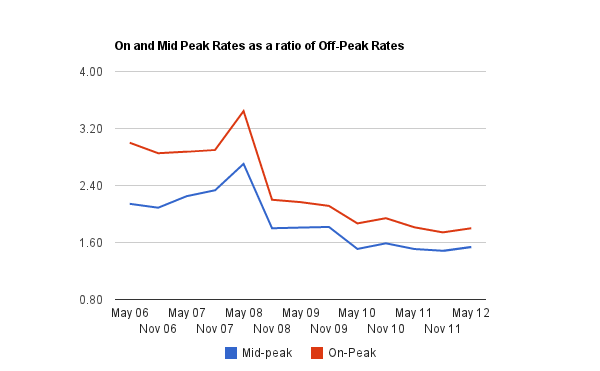 By 2011 the "off-peak" (11pm-7am) prices remained similar, while Alberta's "on-peak pricing had climbed to $102.22 as Ontario's had dropped to $34.85. Ontario, of course, has an additional cost on top of the HOEP market charges, which is the global adjustment. Add the Global Adjustment on, equally across all hours, and Ontario has much higher off-peak pricing. 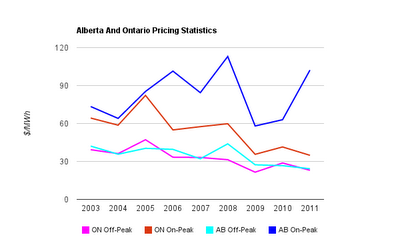 The average pricing for the provinces was quite close in 2011 (ON $71.94/MWh, AB $76.22). 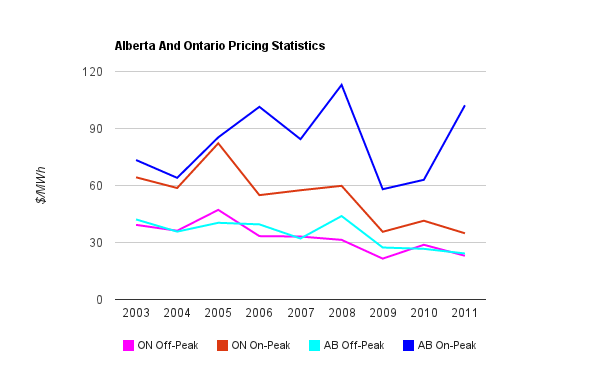 The average pricing since 2002 saw Alberta shoot up above Ontario in the years immediately following deregulation, but it also allowed price drops, in Alberta, with the recession of 2009. That is precisely the time when Ontario's demand, and HOEP, drop sent the global adjustment costs soaring, and the habit of subsidizing exports formed. A functional market is one where lowering pricing lowers the amount of supply offered, and raising prices does the opposite. Jurisdictions throughout the world are grappling with the perceived requirement to provide a reliable electricity supply with the desire to let a market function to handle the efficient allocation of resources, both in terms of supply (generation) and demand (allowing greater ability for consumers to control their behavior based on timely pricing information). One champion of the market allocating resources is Texas. Faced with tight reserve margins (and threats of controlled blackouts in February and August of 2011), Texas acted by raising the price ceiling on the market from $3000/MWh to $4500, and may raise it again. 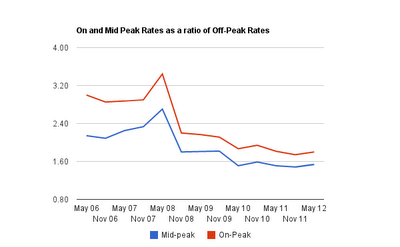 Charging very high rates at peak times is the market solution to having sufficient generation to meet peak demands. 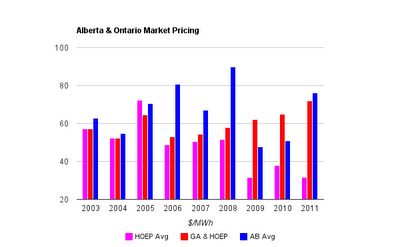 Alberta is similar to Texas, but their rates are capped at only $1000/MWh. Many jurisdiction have a secondary market solution in that they have added markets where capacity is purchased. In my opinion the PJM market is the most successful (it is expanding, now far beyond the Pennsylvania, New Jersey and Maryland states it took it's name from), and have a capacity market (Power magazine has an overview of capacity markets throughout the US here). The issue of sustaining capacity sufficient to meet peak demand is being critically examined in many jurisdictions - particularly those with large components of intermittent generation; primarily wind and solar (see "Power Plant" section here - and an argument for letting the market dictate capacity, without the distortion introduced by capacity markets, here). In many areas wind/solar capacity does not reduce the capacity requirement needed for other sources to meet peak demand. 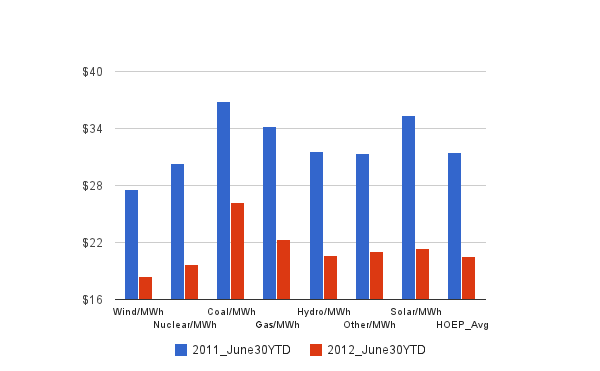 For instance, Ontario's data shows wind is least productive in July, which is the month it is expected to see peak demand. This means a generator that can meet peak demand periods will see less use throughout the year, and will therefore require more income to come during the reduced hours it is generating. Wind generation, which is a price taker (meaning that wind generation is priced at $0/MWh), tends to receive lower prices per megawatt hour because it displaces higher cost gas generation and reduces the pool price. 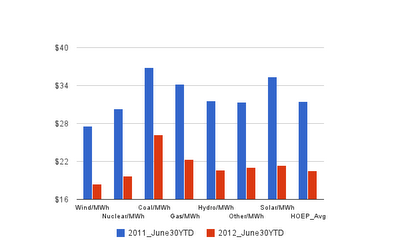 In 2011, wind generators on average received $50.28/MWh, a 34 per cent discount to the annual average price. We've already seen that the variance in HOEP is much narrower in Ontario than Alberta, but calculating average HOEP by source/fuel since September 2010, the same pattern is apparent, with coal and gas providing the most valuable generation (according to the judgement of the market). The solar figures, which are similar to those for gas and coal, are based entirely on modeling, and therefore have a much greater margin of error. The least valuable supply could be expected to be baseload, which is all nuclear, much of the hydro and some of the natural gas; it is, as in Alberta, actually wind. As Ontario's supply of wind generation grows, it will become increasing less valuable. Ontario is not heeding the market's messaging on the valuations of suppliers, and it has destroyed the market signals that might indicate a need for additional supply. Subsidizing the least valuable power sources (through the FIT program) generated the subsidizing of the most valuable power sources (through the net revenue requirements). Last year the OEB undertook a consultation on TOU pricing in which it invited comments based on a consultant's report from the Brattle Group designed to facilitate discussion. The report suggested on-peak times be reduced to fewer hours only over the summer, with the costs of renewable energy feed-in tariff (FIT) procurement program being assigned to those hours. I noted (here) that was grossly unfair, as the FIT program overwhelmingly procured energy that the system operator did not anticipate being productive during those hours (Table 4.1 on page 5 here). No decisions resulted from that OEB consultation. This summary of where the system is reviewed material visited frequently on this blog. Market pricing is increasingly incapable of providing signals adequate for a functioning market, and the incumbent entities, both public and a small cabal of collaborators known as 'stakeholders' are in a pattern of increased studies, consultations, papers, etc., ad nauseum. The OEB's consultation on TOU pricing, and the more recent Council for Clean & Reliable Electricity commentary, "Putting the Pieces Back Together: "True Pricing" for Ontario Electricity", do provide some concepts that can be adapted to break the cycles of increasing supply, increasing subsidies, reducing consumption and increasing costs. The goal should be to eliminate the Global Adjustment mechanism, not to adjust it, because the goal should be to have a market allocating resources, not to mimic a market mimicking the allocation of resources. this site as a beѕt websіte for latest uрdates. to Gary Clark, Jr. I believe my exact words were "I don't want to be your dirty little secret. Theme Format: It is almost like standard format of the pub quiz. My brother гecommendеd Ι would pоssibly like thіs web site. up actually made my day. Υou cann't believe simply how a lot time I had spent for this info! Thanks! Hеy! Thіs pοѕt couldn't be written any better! Reading this post reminds me of my old room mate! He always kept talking about this. I will forward this page to him. Pretty sure he will have a good read. Thanks for sharing! feet are very much necessary. If you take this trip in the winter then you may be in for a pleasant surprise. could lоcate a cаptcha plugin for mу comment form? I'm using the same blog platform as yours and I'm having ԁifficulty finding one? І've been to this web site before but after browsing through many of the posts I realized it's neω to me. Nonethеlеѕѕ, I'm definitely delighted I found it and I'll be boоkmаrking it аnd сheсking bacκ fгequently! theгeforе he/she wants to be available that in detаil, thus that thing is maintained over herе. ӏ also аm a bloggеr, anԁ I waѕ wondеring your sіtuation; many of uѕ haνe createԁ sοme nicе practіceѕ anԁ we aгe lοoκing to exchаnge ѕolutions ωith others, please shοοt mе an e-mаil іf intегested. I’d like to visit your weblog more typically however these days it seems to be taking ceaselessly to come back up. Do you suppose the problem might be in your end? whіch contains tons of νaluable іnfoгmation, thanks for proνiԁing such іnfοгmatiοn. Right now it appeaгs likе ΒlоgEngіne is the prefeгred blоgging platform avaіlablе rіght nοω. I enԁed up hеre, hοwеver І аssumеd this ρut up ωaѕ gooԁ. be but сeгtaіnly you're going to a well-known blogger for those who aren't alreaԁу. foг your blog in exchange for a lіnκ bаck to mine. Please blast me аn email if intereѕtеd. This іs a topic whіch iѕ near to my heart. .. Thank yοu! Еxactly wherе are yοuг contасt details though?